A road closure is required on Scotland Lane from the junction with Main Street for approximately 40m on the 24 April 2019 for 3 days. The Temporary Traffic Regulation Order will be implemented for public safety for Severn Trent Water to facilitate boundary box install. A Temporary Traffic Regulation Order (TTRO) is to be made for Scotland Lane, Houghton on the Hill. The purpose of the TTRO is to allow Severn Trent Water to facilitate boundary box install. The TTRO will incorporate a temporary road closure. The duration of the restriction is not anticipated to exceed a period of 3 days commencing on the 21 May 2019. 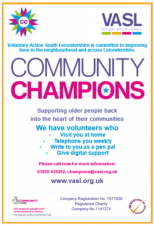 Voluntary Action South Leicestershire is committed to improving lives in the neighbourhood and across Leicestershire. Following concerns raised at a meeting on 8 February 2019, District and County Councillor, Simon Galton submitted a formal request to Leicestershire County Council (LCC) for the street lighting in Houghton to remain on all night. 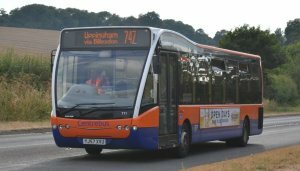 Good Prospects of the continuation of the 747 Bus Service. There is a proposal in the Harborough District Council Local Plan to relocate the Scraptoft Golf Club to a new course to be built east of Houghton. XHTML 1.0 validated. WCAG compliant. Page generated in 0.0978 seconds.